What is your favorite holiday dessert? Could it be CHOCOLATE? I am referring to unsweetened cocoa powder and nuts, which have both been shown to reduce cholesterol and improve your risk of developing cardiovascular disease. 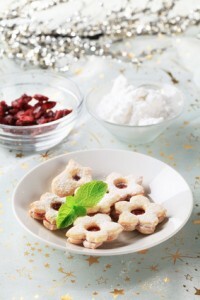 You can easily whip up a sinfully rich and really healthy dessert for your next holiday party. 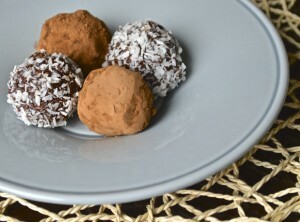 Why not try a no bake recipe of mouthwatering and festive Cocoa Truffles? Place the cashews in a small bowl and add enough water to the bowl to just cover the cashews. Let the cashew soak for at least 2 hours. Once the cashews have soaked, microwave the dates for 1 minute. Add all the ingredients into a food processor/blender and mix until a smooth consistency. Form 1 Tablespoon size balls and cover each ball in a coating of your choice. Put the coated balls onto a baking sheet and place into the freezer. Remove balls 30 minutes before serving. This heart healthy recipe has been contributed by Dr. Janet Brill.